Lots of new and exciting things happening this week. Please read the Newsletter carefully ( ‘cos it takes me a long time to type it!!!). Another great Aquathlon on Friday night. Don’t forget the next one is this week. Thanks to the following sponsers: Bike Force Joondalup, PT Plus, Sorrento Sports Massage, & ExplorOz.com. The Boddington Triathlon is on Saturday. 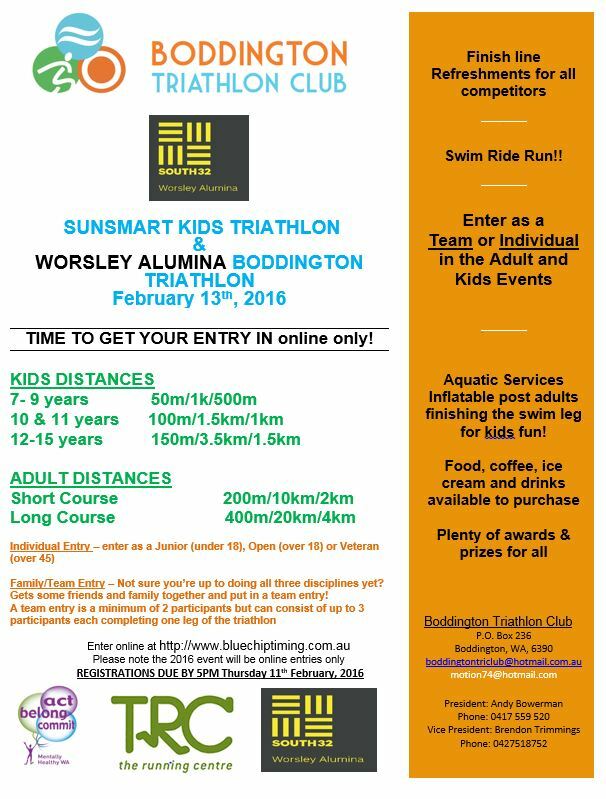 This is a great family event and a lot cheaper than most triathlons here in Perth. This triathlon is part of the Club Series and each participant can earn points for their club towards a major cash prize donated by Triathlon WA. There are 11 events in the series, and this is event No. 3. Brad Hosking’s Ergo Sessions are back on Monday nights 6:30pm in the underground carpark at Whitfords Shopping Centre all welcome. An additional swim session has been added to Wednesday nights from 7:30pm to 8:30pm. Swim squad resumes this week. RIDE: CHOCOLATIERS – No scheduled ride.. There will not be an organised Chocolatiers’ ride this week. Feel free to arrange your own, or join Kevin’s novice ride. Those ladies training for 70.3, I suggest a ride up the coast for about 1.5hrs and return. Venue: Boddington Swimming Pool, Pollard St, Boddington. It’s in a POOL!!!! Details: Less than a 2 hour drive from Sorrento, this is the 3rd in a series of club run events. Get your mates together or make it a family day and enjoy the experience racing at Boddington. Every club member who enters earns points for North Coast. The club with the most points at the end of the season wins a $1500 development grant from Triathlon WA. Take the family and enjoy the fun. Entry prices start from $15 for the kids and $25 for adults. For Details see flyer Online registrations are available here. Details: See Race information for details.